Create, film, edit, and distribute all from one device! The MoJo Kit® is a fully equipped, full high-definition, broadcast quality, mobile multimedia studio for the device you already own. Citizen Journalism is changing the world by empowering local communities to tell their stories from their own perspectives. 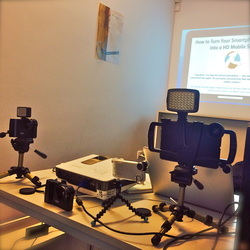 WLSME staff members are keeping up with the latest trends in development by holding a multimedia training on June 26-29, 2013 on state-of-the-art mobile journalism or “MoJo” kits to develop skills that will ultimately contribute to the WLSME program’s success. The interactive, four-day training in basic journalism, new technologies in video production led by media expert, Mike Clarke, prepares WLSME staff to create a series of short films throughout the three-year project. The MoJo kit provides high quality for low cost, with all the tools of a professional videographer combined with the latest technologies. The US Department of State funded Voices4Change (V4C) project centers around our compact mobile journalism studio or MoJo Kit™. The MoJo Kit was first deployed during a V4C mentor training workshop held at the Jordan Media Institute in Amman March 22 -24, 2013 where seven kits were distributed. In total 36 MoJo Kits will be utilized throughout Egypt, Jordan, Lebanon, Libya, Palestine, and Tunisia. V4C aims to empower 600 young people across the Middle East and North Africa (MENA) region to positively influence society by expressing their views, and engaging in national and regional debates on critical social issues facing the Arab region through the power of new and traditional media. •	To promote civic engagement and activism on the part of young people locally, nationally and regionally. International Media Solutions has partnered together with other leading organizations on this groundbreaking project in an effort to create a cadre of young media activists in the MENA region with the confidence, skills and access to make their voices heard. Youth participants will build their skills in media production and collaborate with peers outside of their own community or country. Throughout the program, participants will ask themselves, “How does media contribute to positive social change?” The experience will promote digital storytelling, media literacy, and communication skills among Arab youth throughout the Middle East.